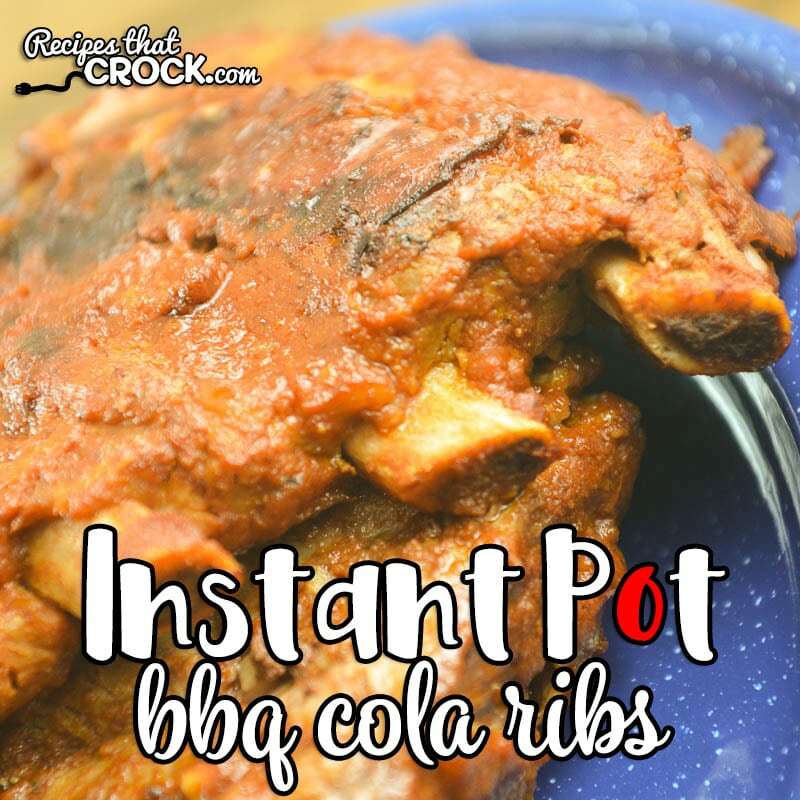 Instant Pot BBQ Cola Ribs (Low Carb) - Recipes That Crock! Are you looking for a quick and simple way to make BBQ Ribs? Our Instant Pot BBQ Ribs are so tender and full of smoky flavor! AND, they are a great low carb recipe too! Cris here. 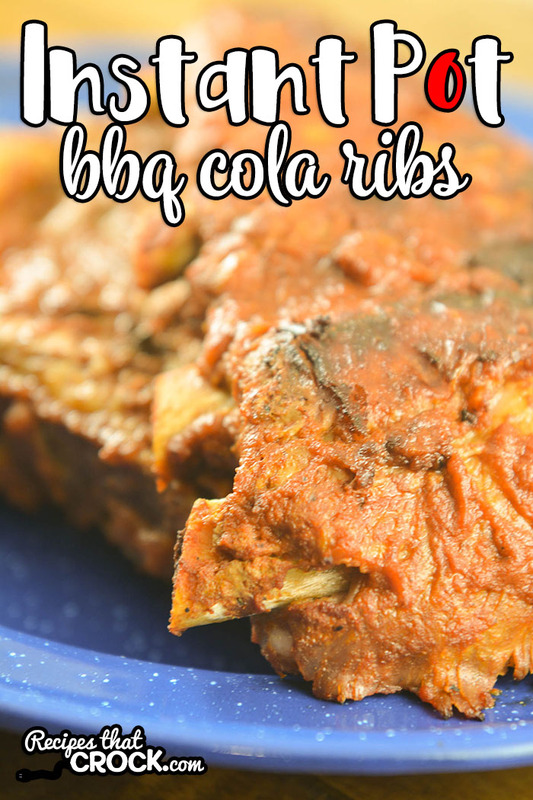 To say I am obsessed with these BBQ Cola Ribs would be a huge understatement. It all started when I was inspired by a sauce I found in one of my favorite low carb cookbooks and created our Low Carb Crock Pot BBQ Cola Ribs and then our Low Carb Crock Pot Cola Pulled Pork. So, naturally, I HAD to make it into an electric pressure cooker recipe too. I just LOVE the smoky flavor of these ribs. I love making all kinds of things with the leftovers, like these Grilled Stuffed Avocados . I love having an instant pot version of this recipe for days when I can’t slow cook them all day. 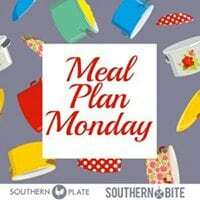 So how do you convert our favorite Crock Pot Ribs recipe into an incredible Instant Pot Recipe? Super simple. Just place your ribs in a 6 quart electric pressure cooker and salt well. Then in a bowl, mix up all the remaining ingredients and pour on top. Cook under high pressure for 25-30 minutes and then naturally release for 15 minutes. Quick Release and remove ribs from the electric pressure cooker. Turn on the saute feature and stir sauce constant until the sauce reduces by half. Slather ribs with sauce and grill to char if desired or serve as is. Enjoy! We have made this many times in our 6 quart Instant Pot and our 6 quart Crock Pot Express. You can use any 6 quart electric pressure cooker. If you cannot use a manual setting, just choose a setting that allows you to cook under high pressure for the desired time. This recipe was inspired by a sauce recipe found in Bacon & Butter Cookbook. If you prefer firmer ribs, cook for 25 minutes, however if you would like super tender ribs, set it to cook for 30 minutes instead. We used Baby Back Ribs, but you can use your favorite ribs. Cooking times may vary. If you don’t care about carbs, feel free to substitute the coke zero for a regular cola, root beer, Dr. Pepper or even cream soda if you are feeling adventurous! Place your ribs in a 6 quart electric pressure cooker and salt well. Then in a bowl, mix up all the remaining ingredients and pour on top. Cook under high pressure for 25-30 minutes and then naturally release for 15 minutes. Quick Release and remove ribs from the electric pressure cooker. Turn on the saute feature and stir sauce constant until the sauce reduces by half. Slather ribs with sauce and grill to char if desired or serve as is. Enjoy! If you don't care about carbs, feel free to substitute the coke zero for a regular cola, root beer, Dr. Pepper or even cream soda if you are feeling adventurous!